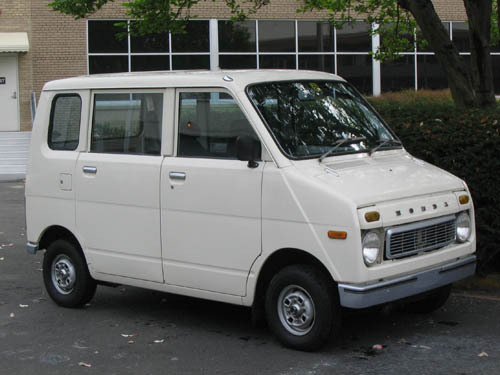 The Honda Life Step Van was Japan’s first microvan. Based on the 1971 Honda Life Sedan, the unique-looking vehicle’s primary mission was to serve as a delivery mule for Japan’s rapidly-growing economy. Honda sold the Step Van on traits such as a large rear opening and low floor for ease of loading and unloading and its “passenger car feel.” On the inside, Honda’s engineers fashioned nifty ergonomic touches such as a slotted glove box for quick check depositing, an integrated pen holder, and a fold-out glove box door that doubles as a writing surface. The Step Van meets the Kei car standards that originated at the end of WWII when most Japanese could not afford a full-sized car. The microvan promoted the growth of the car industry, as well as offered an alternative delivery method to small business and shop owners.